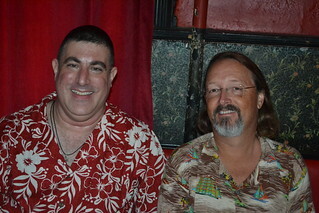 On June 15, 2016 I read with Marc Laidlaw at the Fantastic Fiction reading series at New York’s KGB Bar. Hosts Ellen Datlow and Matthew Kressel made me feel at home. Thank you for having me. I am often an audience member at this series so it was wonderful to be on the other side of the podium. I was fortunate enough to spend the afternoon with author Marc Laidlaw. Marc is not only a talented visionary author he is a hell of a great guy. Marc generously shared stories of his work, tales of some of our favorite authors, gave me sage advice, and shared his thoughts of the moment on his explorations of writing as we hunted down great pizza and coffee. We did find the treasure trove of slippery elm lozenges. Marc and I both read new stories. Marc’s story can be found at Nightmare Magazine. I’m going to update this with several links and photos but for now enjoy the link to Ellen Datlow’s photos. Here are some of my favorite bits and pieces. Please surf on over, read the review, and be sure to support This Is Horror. Thank you to Shane D Keene for reading the book and for his kind words and support.